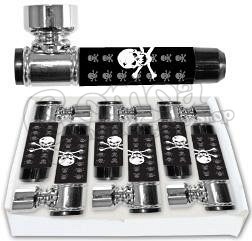 7 cm long metal pipe with skull pattern. Smoking Pipes are a highly efficient means of imbibing your favourite tobaccos and legal smoking blends. We have all the famous designs and brands of bongs, plus a vast array of more affordable smoking pipe designs. There are metal and wooden pipes, soapstone pipes and a huge selection of Glass Pipes & Bubblers.